Meeting the projected 50% increase in global grain demand by 2030 without further environmental degradation poses a major challenge for agricultural production. Because surface ozone (O3) has a significant negative impact on crop yields, one way to increase future production is to reduce O3-induced agricultural losses. We present two strategies whereby O3 damage to crops may be reduced. We first examine the potential benefits of an O3 mitigation strategy motivated by climate change goals: gradual emission reductions of methane (CH4), an important greenhouse gas and tropospheric O3 precursor that has not yet been targeted for O3 pollution abatement. Our second strategy focuses on adapting crops to O3 exposure by selecting cultivars with demonstrated O3 resistance. We find that the CH4 reductions considered would increase global production of soybean, maize, and wheat by 23–102 Mt in 2030 – the equivalent of a ∼2–8% increase in year 2000 production worth $3.5–15 billion worldwide (USD2000), increasing the cost effectiveness of this CH4 mitigation policy. Choosing crop varieties with O3 resistance (relative to median-sensitivity cultivars) could improve global agricultural production in 2030 by over 140 Mt, the equivalent of a 12% increase in 2000 production worth ∼$22 billion. Benefits are dominated by improvements for wheat in South Asia, where O3-induced crop losses would otherwise be severe. Combining the two strategies generates benefits that are less than fully additive, given the nature of O3 effects on crops. Our results demonstrate the significant potential to sustainably improve global agricultural production by decreasing O3-induced reductions in crop yields. Agricultural sustainability and intensive production practices. A doubling in global food demand projected for the next 50 years poses huge challenges for the sustainability both of food production and of terrestrial and aquatic ecosystems and the services they provide to society. Agriculturalists are the principal managers of global usable lands and will shape, perhaps irreversibly, the surface of the Earth in the coming decades. New incentives and policies for ensuring the sustainability of agriculture and ecosystem services will be crucial if we are to meet the demands of improving yields without compromising environmental integrity or public health. 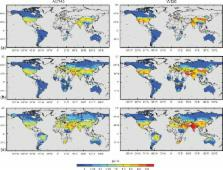 Forecasting agriculturally driven global environmental change. During the next 50 years, which is likely to be the final period of rapid agricultural expansion, demand for food by a wealthier and 50% larger global population will be a major driver of global environmental change. Should past dependences of the global environmental impacts of agriculture on human population and consumption continue, 10(9) hectares of natural ecosystems would be converted to agriculture by 2050. This would be accompanied by 2.4- to 2.7-fold increases in nitrogen- and phosphorus-driven eutrophication of terrestrial, freshwater, and near-shore marine ecosystems, and comparable increases in pesticide use. This eutrophication and habitat destruction would cause unprecedented ecosystem simplification, loss of ecosystem services, and species extinctions. Significant scientific advances and regulatory, technological, and policy changes are needed to control the environmental impacts of agricultural expansion. Global land use change, economic globalization, and the looming land scarcity. Mitigation Strategies for Greenhouse Gas Emissions from Agriculture and Land-Use Change: Consequences for Food Prices. Inclusion of sainfoin (Onobrychis viciifolia) silage in dairy cow rations affects nutrient digestibility, nitrogen utilization, energy balance, and methane emissions. Recent climate and air pollution impacts on Indian agriculture.